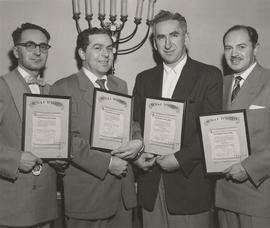 Photograph depicts a group of certificate recipients. Possibly shown in the back row are Mr. Feldstein, Mrs. Feldstein, Mrs. Blossom Wine, and Mr. Myer Wine. Photograph depicts President Ace Hersh (right) presenting the B'nai B'rith Lion's Gate Lodge softball championship trophy to Past President Sam Gordon (left), captain of the Shlemeels. Photograph depicts Alec Jackson (left) and Myer Moscovitch (right) at a B'nai B'rith Lion's Gate Lodge #1716 installation banquet at the Georgia Hotel. Written on verso: Lion's Gate Lodge #1716 installation banquet + dance. 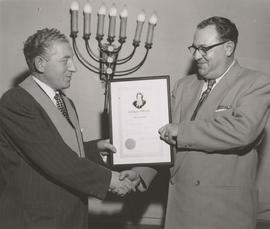 Photograph depicts Alec Jackson (left) presenting Sid Greenberg (right) with a distinguished service award at a B'nai B'rith Lion's Gate Lodge #1716 installation banquet at the Georgia Hotel. Photograph depicts Alec Jackson (left) and Harold Lauer (right) at a B'nai B'rith Lion's Gate Lodge #1716 installation banquet at the Georgia Hotel. Photograph depicts Sid Greenberg (left) presenting Alec Jackson (right) with the Past President pin and gavel at a B'nai B'rith Lion's Gate Lodge #1716 installation banquet at the Georgia Hotel.